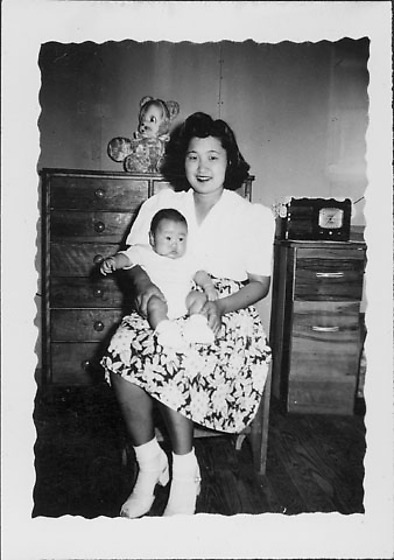 Portrait of smiling woman in a floral print skirt and white short-sleeved blouse sitting in a chair holding infant on her lap at Rohwer concentration camp, Rohwer, Arkansas, 1942-1945. Infant wears white clothing and shoes. Stuffed bear sits atop a chest of drawers in background, L. Radio on desk, background R. Image has irregular scalloped border. Written in pencil on back, TC: [circled letter] D.